Uniquely engineered for slab-on-ground and precast applications with higher tensile strength to provide better "Built-In-Reinforcement". To learn more, contact a representative below. Plexus™ Synthetic Macrofibers are uniquely engineered for slab-on-ground and precast applications with higher tensile strength to provide better “Built-In Reinforcement” as a replacement for steel fibers, welded-wire fabric (WWF) and conventional reinforcing bars in a variety of secondary reinforcement applications. In addition, Plexus™ Fibers help to minimize temperature shrinkage cracking, plastic settlement and plastic shrinkage cracking. Plexus™ Fibers distribute uniformly throughout the concrete matrix and deliver excellent finish-ability. FABPRO’s proprietary parallel packaging system aligns all of the fibers in the bag to ensure outstanding fiber distribution in the concrete mix and creates a compact package that results in the lowest possible product freight and storage costs. 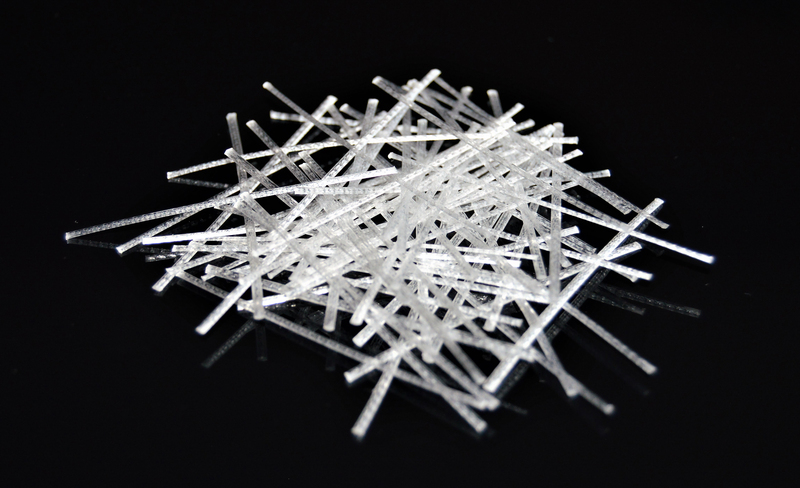 PLEXUS™ 44F Synthetic Macrofibers are high tensile fibers manufactured from a blend of 100% virgin polyolefin resins. FABPRO’s PLEXUS™ Macrofibers meet the requirements of ASTM C1116/C1116M “Standard Specification for Fiber-Reinforced Concrete”. Eliminates the need for WWF and rebar used as secondary reinforcement in most applications. Improves green strengths and permits earlier stripping of forms with less rejection. Reduces construction time, and overall labor and material costs. Increases flexural toughness, impact and abrasion resistance. Need to take some information with you? PLEXUS™ Synthetic Macrofibers, when used at an appropriate dosage, are an excellent option for the replacement of WWF and rebar as a safe and easy-to-use reinforcing system. The fiber is rust proof, alkali resistant, and compliant with industry codes when used in concrete mixed in accordance with ASTM C94/C94M. The minimum dosage rate for PLEXUS™ Synthetic Macrofibers is 3 lb/yd³ (1.8 kg/m³). PLEXUS™ Fibers can be used at dosage rates from 3 lb/yd³ (1.8 kg/m³) up to 13 lb/yd³ (7.7 kg/m³) or the equivalent dosage of 0.2% to 0.9% by volume, unless otherwise specified. For composite metal deck applications, minimum dosage is 4 lb/yd³ (2.4 kg/m³) as recommended by the Steel Deck Institute (SDI C-1.0) design code provisions. PLEXUS™ Fibers are packaged in pre-weighed, ready-to-use, degradable bags which are designed to be introduced at any time before or during mixing of concrete produced in accordance with procedures specified in ASTM C94/C94M. PLEXUS™ Fibers are packaged in compact, pre-weighed degradable 3 lb (1.4 kg), 4 lb (1.8 kg) and 5 lb (2.3 kg) bags that can be added directly to the mixing system.